AT&T (T) has been in the spotlight much of this year. Not only does its satellite TV business continue bleeding subscribers, but the company's debt load ballooned following the firm's acquisition of Time Warner. With roughly $170 billion in net debt and $13 billion in annual dividend payments that consume more than half of AT&T's free cash flow, some income investors are nervous that a dividend cut is inevitable to help shore up the balance sheet. Based on the information we know today, that outcome seems unlikely. On November 29, AT&T's management hosted an investor conference and made statements in support of our belief, helping fuel a 2.2% rise in T's stock price the following day. "If you hear nothing else this afternoon, I want you to hear me on this. Our discretionary cash flow is going to go to one place. It's going to be paying down debt. We took on debt to do the Time Warner deal. We told you when we announced the deal, it would take a little over a year to get the debt back to more comfortable levels." He also said the company has a number of initiatives and asset sales in the pipeline for 2019 to help get leverage down to 2.5x exiting 2019. Importantly, AT&T expects to hit its leverage target even in light of any lumpy capital outlays such as spectrum for 5G. As leverage falls, AT&T's dividend safety will improve. Management reviewed guidance for 2019 as well. The firm's dividend payout ratio is expected to sit just below 60%, leaving around $12 billion of retained free cash flow that can be used to chip away at AT&T's debt load. Importantly, management expects adjusted earnings per share to grow at a low single-digit pace (earnings growth was flat last quarter). Stabilizing its Entertainment segment, which includes the struggling DirecTV satellite business, will be key to AT&T's ability to maintain and grow its earnings going forward. To this end, management provided additional details about how they hope to hold this segment's EBITDA steady next year. Cost reductions, broadband growth, and smarter pricing and promotions are all expected to contribute meaningfully to the company's stabilization efforts. If successful, those results would mark a major improvement compared to the double-digit decline in EBITDA this division suffered in 2018. AT&T's breathing room would also increase, taking some of the performance pressure off of its other businesses. Of course, there are plenty of reasons to be skeptical of management's ability to deliver those results. Cord cutting shows no signs of slowing down, and the company is still very much trying to figure out how to run a fast-growing yet profitable streaming service. However, stepping back, investors must realize that this challenged segment is only one part of AT&T's business, despite all the attention it gets. 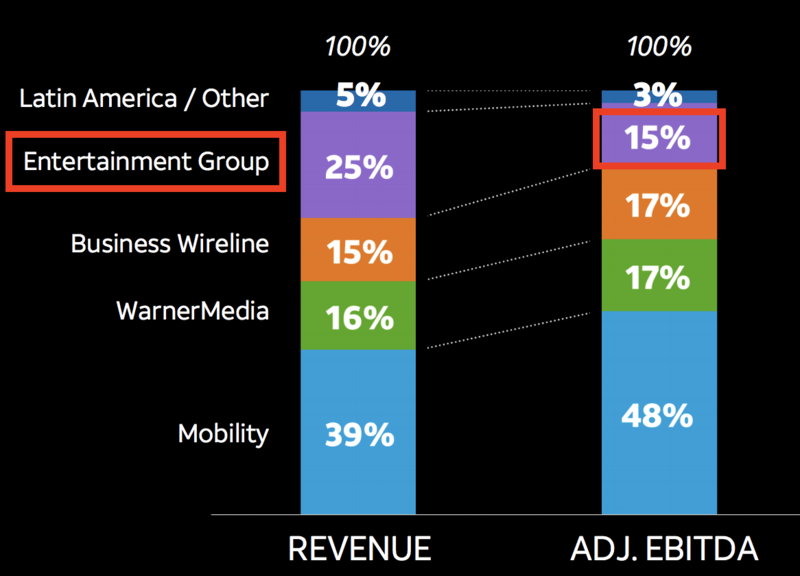 In fact, the Entertainment Group is only 15% of AT&T's total adjusted EBITDA. Its Mobility segment accounts for close to half of profits and continues plodding ahead with low single-digit growth. WarnerMedia is humming along with mid-single-digit revenue growth, and Business Wireline remains a fairly steady cash cow. In other words, AT&T's well-diversified operations are helping the company hold its ground, deleverage, and pay a generous dividend while the Entertainment Group's struggles are addressed. AT&T is not out of the woods yet, and talk is cheap. However, with 2019 only a month away, it is encouraging to hear management's confidence about delivering on their deleveraging goals and stabilizing the firm's Entertainment Group. Given the firm's stretched balance sheet and sizable dividend, it’s critical that AT&T is able to deliver moderately growing free cash flow in the years ahead. AT&T's dividend appears to remain secure for now, and we will continue monitoring the firm's free cash flow generation in the quarters ahead to make sure its dividend safety profile does not deteriorate.